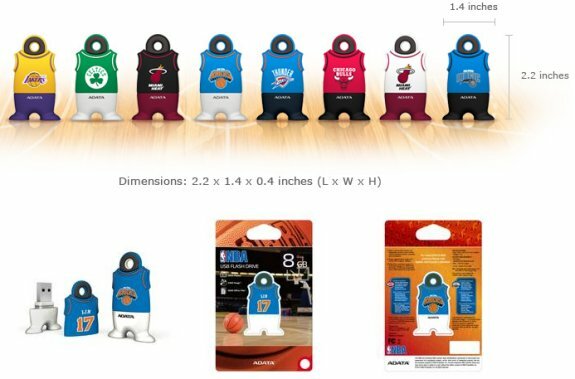 ADATA presents a new line of flash drives with NBA theming. Unfortunately, it's USB 2.0 only and the maximum capacity is just 8GB. ADATA™ Technology today announced the addition of New York Knicks’ Jeremy Lin to its NBA Flash Drive line. Lin will join a line-up that includes products featuring Boston Celtics’ Paul Pierce, Chicago Bulls’ Derrick Rose, Los Angeles’ Kobe Bryant, Miami Heat’s Dwyane Wade and LeBron James, New York Knicks’ Amar'e Stoudemire, Oklahoma City Thunder’s Kevin Durant and Orlando Magic’s Dwight Howard.